Life as we know is over in the transmogrified plot of real estate where Annihilation happens. It’s the latest scifi movie that shows how the end of the world often becomes the start of something simultaneously lovely and dangerous, a paradoxical approach that’s stretched back decades. Here’s a list of entertainments where the world has broken down, but become something grander as a result. It’s only a little slice of the Earth that gets all messed up in Annihilation. But Alex Garland’s film adaptation of Jeff VanderMeer’s novel offers up a freakily imagined world where lifeforms can take on each other’s aspects. So you get plants in the shape of people and people in the shape of horribly exploded things-gone-wrong. The exquisite art designs make the landscapes and animals inside the Shimmer feel crystalline: Sharp, dangerous, light-bending things that you need to see, even if it means you might die. This avant-garde Japanese animated film from 1985 contains almost no spoken dialogue. Instead, a sense of otherworldly dread gets communicated primarily through the gorgeous visuals surround the nameless boy and girl moving through them. Angel’s Egg balances moments of oppressive militarism with pastoral beauty and watching it is like seeing a new myth being born right in front of your eyes. In 1982, the original Blade Runner wowed audiences with a riotous clash of people, things, and styles choking the streets of a cloudy, overbuilt Los Angeles, resulting in a dark but still hauntingly beautiful future. The chaotic mix of artsy future fashion and grimy retro-noir sensibilities made it a cyberpunk classic. Decades later, Blade Runner 2049 pulls out the camera to show more of the ecologically doomed world, with aesthetic design that uses lighting as a metaphor for the movie’s existential continuum. 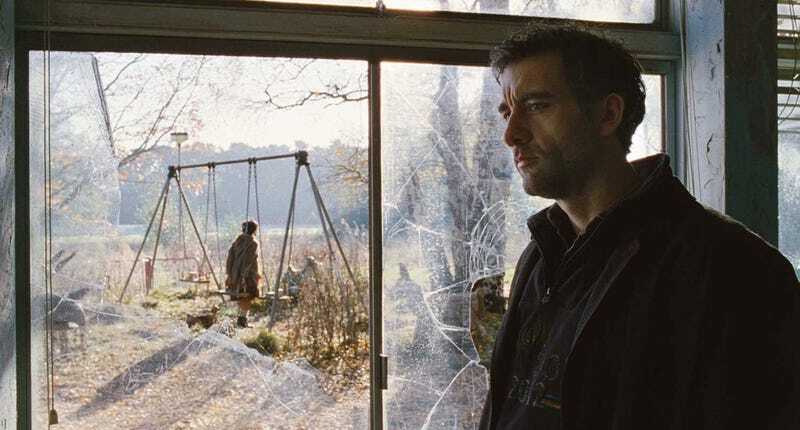 Children of Men happens in a near-future where the entire human race becomes infertile, and Alfonso Cuarón’s adaptation of the book by P.D. James wallows in bleak apathy. The hopelessness is best typified by the film’s most iconic sequence, set in a school and playground that have been empty for years. As audiences move through frantic streets and the well-appointed spaces of the ultra-rich, the sadness of a world crashing into extinction only multiplies and makes you wonder if art can mean anything without future generations to pass it on to. In this multiplatform game from a few years back, you’re a cybernetically enhanced operative tasked with hunting terrorists in a New York City that’s become a literal concrete jungle. With lush foliage intertwined with imposing skyscraper architecture, the environmental design in Crysis 3 offers up the best of two very different worlds, smashed together in a chaotic way. This scifi reimagining of a classic Chinese mythological epic pairs a bruiser named Monkey with a tech adept named Trip as the latter forces him to help her make a perilous journey back home. Andy Serkis played Monkey in this 2010 release and supervised all the motion-capture work, but the gorgeous backdrops shine just as bright as the human performances here. The vistas are quiet and broken, but overrun with vegetative details that feel hostile. When you come across landmarks like the Empire State Building and see that nature’s having its way with the iconic structure, it’s a gigantic sign that the age of man has long past. The things that make the PlayStation 4 game so beautiful are also what make it so dangerous. Horizon: Zero Dawn’s robot lifeforms come in all shapes and sizes, moving through bucolic tableaus with animations that make them hypnotic to watch. The Tallnecks, Stormbirds, and Thinderjaws lose all of their charm once they start trying to kill you, but they’re still damned beautiful. In the film adaptations of Suzanne Collins’ best-selling dystopian YA books series, the grimy desperation of an underclass fighting to live another day clashes with the bespoke excess and idiosyncratic taste of the elites who stage the battles-to-the-death serving as entertainment for the masses. The clothes and furnishings seen in the Capitol may look delectable in the movies, but you can never forget that they’re worn and used by the worst people in the world. Few video game enemies in recent memory are as horribly disgusting as the Clickers in The Last of Us. The misshapen heads of these once-human antagonists have been exploded by a viral fungus that takes over their bodies. But as protagonists Joel and Ellie nervously journey through an America ravaged by plague, they also encounter scenes of feral beauty that illustrate the new balance of a world that’s gone back to being wild. George Miller followed up his classically grungy dystopian work with a sequel that’s still rough-hewn but increasingly elegant. The way Fury Road frames its hotrod survivalism against swirling desert landscapes fills the proceedings with a wonderful manic rumbling, making its moments of silence all the more precious. Brutalism is the order of the day in these first-person shooters set in a post-apocalyptic Russia destroyed by nuclear warfare. Lethal radiation forces the remaining human survivors to live underground in the messy ruins of once-great infrastructure. Still, there’s a harsh beauty in the way that light filters through the desolation and the slight illumination is just enough to make you want to find some hope. In the hands of others, giant insects and warring kingdoms would be an excuse to throw up loads of gore and violence. But animation legend Hayao Miyazaki created a classic fable filled with his signature wonder and hauntingly beautiful portryal of the natural world. The stakes never feel anything less than all-consuming in this movie, but there’s a gentleness that still manages to waft up from the Valley of the Wind. The entire world seems to have traveled back in time in the original Planet of the Apes movies, where simians rule the planet and humans have become slaves. It’s a feast of barbarian aesthetics—rags, loincloths, earthenware—in a landscape where everything is wild and untamed—except the apes themselves. Junk and neglect have taken over the Earth in this Pixar classic where humanity’s sloth is a horrific end-times consequence to life among the stars. The ruined planet is a playground of sorts for Wall-E, who soon finds himself rocketing into space. Once there, the mountains of excess waste get replaced by cold sterility, but his blooming relationship with the sleek Eve imbues them both with the verve and connections that flesh-and-blood people have left behind. Sean Connery’s absurd outfit from the 1974 scifi movie has become the stuff of legend. But the sets and special effects from Zardoz display a frenetic sensibility, too. Putting the movie’s floating stone heads and hedonistic costume designs amid rolling hillsides gives the entire affair a feverish, albeit distinctly ‘70s flavor all its own. It doesn’t make a whole lot of sense but is a hell of a thing to look at.